One of the world's leading experts on language and the mind explores the idea of human nature and its moral, emotional, and political colorings. 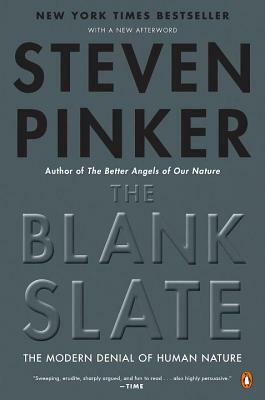 With characteristic wit, lucidity, and insight, Pinker argues that the dogma that the mind has no innate traits-a doctrine held by many intellectuals during the past century-denies our common humanity and our individual preferences, replaces objective analyses of social problems with feel-good slogans, and distorts our understanding of politics, violence, parenting, and the arts. Injecting calm and rationality into debates that are notorious for ax-grinding and mud-slinging, Pinker shows the importance of an honest acknowledgment of human nature based on science and common sense. Steven Pinker, author of The Better Angels of our Nature, is the Harvard College Professor of Psychology at Harvard University. A two-time Pulitzer Prize finalist and the winner of many awards for his research, teaching, and books, he has been named one of Time's 100 Most Influential People in the World Today and Foreign Policy's 100 Global Thinkers.